When creating and managing skills, you can choose to allow trainees to upload their own skills so they can be reviewed by supervisors and approved. Create or edit an existing skill. On the Skill detail page you'll need to enable the following options, Visible to Trainees and Trainees can submit. You can enable the additional third option Supervisor Approval Required If you'd like the trainees skills to be sighted and verified by a supervisor before they are recognised as 'achieved' in the system. 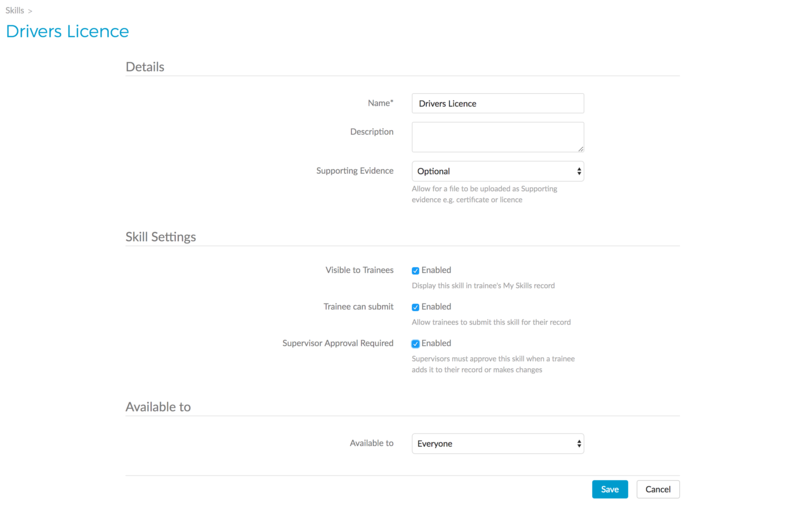 Once these settings are enabled and a trainee uploads this skill, an email is sent to their supervisor or the account administrator to notify them a new skill has been uploaded. They will then be able to log in to Velpic and approve skills from the users profile or on in the Review area.